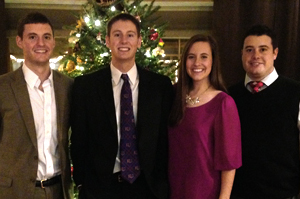 John Reber SP07; Callie Reber SP09; and Joseph Reber SP11, have studied at CIMBA and Luke Reber, will attend spring 2015. While the European travel experience is an alluring benefit for your child, perhaps even more important is the process itself. We saw each of our children leave for Europe with much trepidation regarding the solo overseas flight, staying in Venice, locating the train or bus to the rural campus at Paderno del Grappa, and navigating the transportation systems in a foreign country. Each had travel issues during their trip, but returned as seasoned travelers. The group travel provides a measure of safety and allows them to experience and manage the different transportation systems of trains, buses, and good old-fashioned walking. The education gained from mastering and adapting to countries with different customs are lifetime skills that can be used in travel, business and life. Another key feature of the semester is the opportunity to meet other students from other universities. My children returned with new friends from universities throughout the United States. The relatively small group at CIMBA provides an opportunity to get acquainted and make new friends, both in the classroom setting and during the travel periods. We have enjoyed watching my three oldest keep in touch with their “Italy” friends, and observing the breadth of their new network. The additional tuition and the travel costs create an expensive experience, but an unforgettable learning opportunity. Frankly, this money may have been the most productive we have spent on education. Our children gained a global perspective and enlightenment in a short time before career, marriage and children make such opportunities impossible.